It’s important for you to become acquainted with your D5300’s most important exposure guide: the exposure meter. The meter tells you whether the camera thinks your picture will be properly exposed at your chosen exposure settings. You can see a close-up look at how the meter looks in the viewfinder. P, S, and A modes: The meter doesn’t appear unless the camera anticipates an exposure problem — for example, if you’re shooting in S (shutter-priority autoexposure) mode, and the camera can’t select an f-stop that will properly expose the image at your chosen shutter speed and ISO. Waking up the meter: By default, the meter appears when you press the shutter button halfway and then turns off automatically after 8 seconds of inactivity to save battery power. To wake up the meter, just give the shutter button another half-press. You can adjust the meter’s auto shutdown timing via the Auto Off Timers option, found in the Timers/AE Lock section of the Custom Setting menu. Reading the meter: The minus-sign end of the meter represents underexposure; the plus sign, overexposure. If the little notches under the meter fall to the left of 0, the image will be underexposed. If the notches move to the right of 0, as shown in the second example, the image will be overexposed. When all notches except the center bar disappear, you’re good to go. The markings on the meter indicate exposure stops. The squares on either side of the 0 represent one full stop each. The small lines below, which appear only when the meter needs to indicate over- or underexposure, break each stop into thirds. So the middle readout, for example, indicates an overexposure of 1 and 2/3 stop. If a triangle appears at the end of the meter, the amount of over- or underexposure exceeds the two-stop range of the meter. In other words, you have a serious exposure problem. You can reverse the meter orientation. For photographers used to a camera that orients the meter with the positive side appearing on the left and the negative side on the right — the design that Nikon used for years — the D5300 offers the option to flip the meter to that orientation. 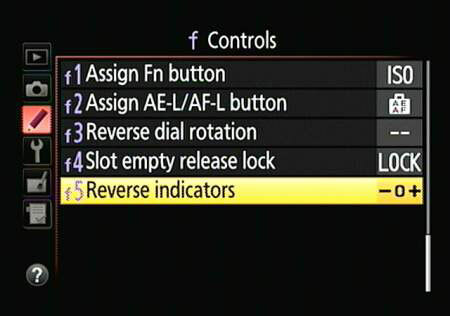 This option also lies on the Custom Setting menu, on the Controls submenu. Look for the Reverse Indicators option. Understanding how exposure is calculated: The information the meter reports is based on the Metering mode, which determines which part of the frame the camera considers when calculating exposure. At the default setting, exposure is based on the entire frame, but you can select two other Metering modes. There’s one metering quirk to note with respect to Live View photography: In Live View mode, metering may be calculated differently for some scenes than when you use the viewfinder. The rationale is to produce an exposure that’s close to what you see in the live preview, which gets darker or lighter as you change exposure settings in an attempt to simulate the exposure you’ll get. However, it’s not a good idea to trust the preview, because it can be deceiving depending on the ambient light in which you’re viewing the monitor. In addition, when you apply Exposure Compensation, an option that produces a brighter or darker image in the P, S, and A modes, the monitor can’t adjust itself to accommodate the full range of Exposure Compensation settings. Long story short: The meter is a more accurate indication of exposure than the live preview. Finally, keep in mind that the meter’s suggestion on exposure may not always be the one you want to follow. For example, you may want to shoot a backlit subject in silhouette, in which case you want that subject to be underexposed. In other words, the meter is a guide, not a dictator.